Earlier this year, News Corp newspapers and its online sites splashed a story with the headline: The secret fee list your doctor doesn’t want you to see‘ (paywall). Lawyer and medical billing expert Margaret Faux, a regular Croakey contributor, reports in the post below that she nearly choked on her cereal when she read the report, which she says will only serve to further confuse consumers. Melissa Sweet also contributed to the editing of this article. 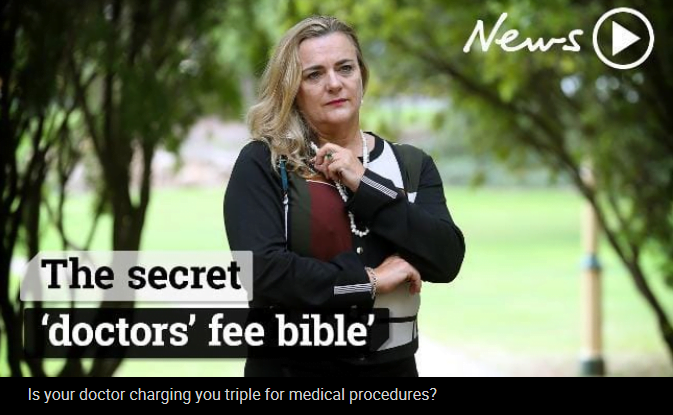 The article, by veteran health reporter Sue Dunlevy, described a secret fee bible which Ms Dunlevy alleged was used by doctors to set fees. And further, that by keeping the bible hidden, consumers had somehow been kept in the dark regarding the reasonableness of doctors’ fees. This article challenges the entire premise of Ms Dunlevy’s article – the secret fee bible – and suggests that the impact of the article on consumers, who are already angry about medical bills and out of pocket costs (OOP), will likely be to confuse them further. There are three key areas of concern. Ms Dunlevy uses the term ‘doctors’ throughout her article, implying the so called ‘secret fee bible’ is used by all Australian doctors, which is false. Many doctors would rarely or never use or even have seen the AMA Schedule of Fees (the AMA list) – see point 3 below. Doctors are individually responsible for their fees, facilitated by a provision in the Australian Constitution. Further, available evidence strongly suggests that Ms Dunlevy’s assertion that all doctors use this so called fee “bible” to benchmark their fees is incorrect. Australian Prudential Regulation Authority (APRA) data indicates that 88.1 per cent of specialist services are billed on a no-gap basis and the current out of pocket (OOP) costs discourse makes clear there is no consistency in specialist fees. If all doctors are using the ‘secret fee bible’ to determine fees, why are specialist fees inconsistent? There is nothing ‘secret’ about the AMA list. It is in fact the genesis of the very first Medical Benefits Schedule when Medibank was introduced in 1975 and has been publicly referred to regularly for over 40 years. The AMA does not set fees and every doctor is duty bound to determine their own fees. The AMA list should be used for costing assistance and guidance only. The AMA list is merely the AMA’s view of what it believes are fair and reasonable fees. If Ms Dunlevy has a version of the AMA list that excludes such disclaimers, she has a duty to make it known. The truth is that no doctor (or anyone) can ‘make the list public’ without committing a breach of copyright, because the AMA list is the intellectual property of the AMA. The AMA is therefore within its rights to restrict its use and distribution. The AMA list is available to all 20,565 specialists, career medical officers and general practitioners who are AMA members. This represents roughly 20 per cent of Australia’s 114,675 medical practitioners, according to figures available from the 2017 AMA Annual Report and the most recent Medical Board of Australia registrant data report. It is important to note that no Australian doctor is required to be a member of the AMA, as it is a voluntary membership organisation. In addition, other organisations, such as software companies, can also avail the AMA list upon payment of the relevant licence fee. So, this is hardly a secret conspiracy. The main use any doctor has for the AMA list is for workers compensation billing where the AMA rates are often the legally applicable rates. However, many doctors rarely or never see workers compensation patients and therefore have no need for the AMA list at all. In circumstances where a doctor has a workers compensation patient and the AMA rates apply, the workers compensation insurers are required to provide those rates to treating doctors anyway, so doctors can get the rates from the insurers as required, and so can the public or media if they wish. The Health Insurance Act 1973 stipulates that Medicare benefits are payable for professional services…Medical practitioners are free to set their fees for their professional service. To be clear, Medicare pays benefits, it does not recommend fees. Implicit in the overall thrust of the article, which pointed blame in the direction of the AMA, was the suggestion that the AMA has power over doctors billing behaviour and can change it. It can’t. To suggest the AMA has power to control doctors’ fees is as absurd as suggesting the Surf Life Saving Association (another voluntary membership organisation) has power to make all local councils charge people for going to the beach. The proposition is preposterous. It suggests the AMA has legal authority greater than that of the Australian Constitution. The truth is that neither the AMA rates, nor the private health fund fee lists, nor the Medicare Benefits Schedule, nor any other fee list are a benchmark for doctors’ fees and never have been, so the concept of reasonableness based on these lists is a fiction. It is an unfortunate reality that it is currently not possible for anyone, neither patients, nor payers, nor doctors to decide whether fees for medical services are ‘reasonable’ because we currently have no measure of reasonableness in relation to the setting of doctor’s fees. Only doctors themselves can determine their fees, and to do that, some of them use the AMA list some of the time, but most use the myriad other fee schedules most of the time. After all, if you did want to benchmark medical fees why would you have over 30 separate lists of benchmarks? Ms Dunlevy’s article also included a ‘rip-off calculator’ which displayed the below image designed to make consumers believe that if a surgeon charges $5,000-$10,000 for a knee replacement they are being ripped off, which in many cases may be true. However, a patient can commonly not pay an out of pocket payment for a knee replacement, even though the relevant bill will display a fee close to $6,000 as the below table demonstrates. The above is just one example of the more than 30 rates and rebates available for every single medical service in Australia, almost all of which are freely available for consumers and the media to download from public websites. Medical billing, the pricing of medical services and the integrity of the Medicare program are profoundly complex areas of law and economics. And whilst provocative writing on the topic is fine, it must generate robust, evidence-based discussion. Provocation is disingenuous, particularly when it misleads those it is pretending to help. I welcomed the opportunity to speak with Sue Dunlevy about her article, before finalising this piece. Whilst I respect her view that her article may have prompted some consumers to ask questions of providers when fees seem excessive, I disagree that it will achieve that aim. My view is that the net effect of the article will be to make matters much worse for already confused consumers. How will consumers make sense of fees when even the Commonwealth Government has three separate fees for a knee replacement, ranging from $988-$3,900? And why does a BUPA policy holder in Victoria attract a rebate almost $400 more than a counterpart policy holder in NSW? At the grass roots level where I have spent the last 30 years, my experience is overwhelmingly that most patients will not ask questions about fees for a variety of complex reasons. But the one thing patients are grateful for is the truth, even if it means they may have a gap to pay. What they hate is being mislead about fees and finding themselves in invidious positions which erode trust at a time when they are vulnerable and need more than ever to feel they can trust their doctor. If we genuinely wish to help consumers understand their rights and get to the bottom of why a small percentage of doctors charge egregious fees, those who report must maintain a disciplined approach to fact checking and refrain from hyperbole. Fake news in public health: what’s the antidote?